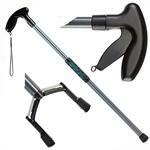 Strong all metal outdoor trash grabber is Made in USA. Jaws open over 5 inches wide. Available in 33 and 40 inch lengths. 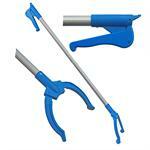 Strong outdoor use grabber with bigger handle designed for gloved hands. Ratcheting lock can be turned on or off. Available in lengths from 20 inches to 12 feet. Unique squeeze grip is best for reaching objects from high shelves. Opposing rust proof fingers open over 5 inches. No parts to fall off and no parts to replace. Available in 16, 28, and 36 inch lengths.